The streams are abundant in numbers, though not great in size. The Connecticut skirts the edge of the county for nearly seventy miles, if measured as it flows, and this is really the Qunni-tuk-ut, or "long river country," from which word Connecticut is doubtless derived. 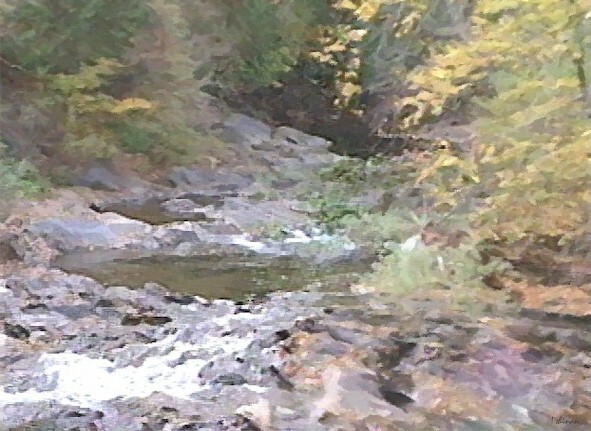 The Nulhegan, or “Fish river " of the Indians, still retains the Indian name and many of the fish, and is the largest that is entirely within the county. Moose river, so called from the abundance of moose formerly found in its vicinity, has at least a length of thirty-five miles in the county, and was formerly a very regular stream in its flow; but the cutting off of the forest from which its regular supply was kept up, it is quite irregular at the present time, being nearly dry in midsummer and proportionally augmented in its flow during freshets. Paul's stream can hardly be dignified by the name of river, and Island pond affords but a small stream for the Clyde. There are numerous brooks, all furnishing more or less trout to the fishermen, and the uneven country furnishes many mill-sites; but the mills which in earlier times supplied the wants of the people are fast going to decay or being supplied with power by steam; as the failing water-supply incident upon the cutting away of the forests render the water-power, so regular of old, nearly worthless. This county is well supplied with pure soft water from springs, so fully that almost every farm house can be accommodated with a stream of running water. There are also several mineral springs of note, among which are the Brunswick springs, situated in that town upon the bank of the Connecticut river, but some forty feet above high water and some twenty feet below the top of the bank. The water boils up in a semi-circle in six or seven places, and what is remarkable, seems to be of different mineral strength. One spring is pure as any spring water, while all the others are impregnated in a greater or less degree. On the top of the bank, a few feet higher and perhaps a dozen rods distant from these springs, is a pond covering twenty-five or thirty acres. The water in this pond is clear and cold, and usually contains an abundance of fish, but once, perhaps, in ten or twelve years, the fish suddenly sicken, and in a few hours die. In their spasmodic effort they roil the water, otherwise clear, and it has a milky appearance for several days. This gradually subsides, and in two or three years fish are again found. The frogs also leave the pond in great numbers when the fish die, and for several weeks no animal life is seen around it. The cause of this great mortality is not known, yet it seems not improbable that the gas engendered from the same cause that impregnates the springs, may occasionally escape through the pond, impregnating the water, and thus destroying the animal life. The geological formation is here in some doubt; but the springs appear to issue from the mica slate formation, yet near its conflux with the protogine and granite of northern Essex. A qualitative analysis of the strongest spring gives the following results: -- One gallon of water contains 87½ grains mineral and organic matter, which is composed of carbonate of potash, carbonate of soda, carbonate of lime, carbonate of magnesia, protoxide of iron, sulphuric acid, silicic acid, carbonic acid, chlorine, and a residum of organic matter not yet determined. This spring, although chalybeate, is also strongly saline, being highly charged, with alkaline salts. Very near this spring another boils up impregnated with sulphuretted hydrogen. It has 55½ grains of mineral to the gallon. It is strongly impregnated with sulphur, but does not contain as much saline matter as the others; yet it is a strong chalybeate alkaline water, and both must be very useful in cutaneous diseases, also as an alterative. Water collected from a third spring, within a few inches, contained forty-nine grains of mineral to the gallon, and is similar to the first mentioned, only not so strong. These springs perhaps more nearly resemble the chalybeate springs of Germany than any others in New England, and are deserving of further investigation. Next in importance seems to be a spring in Lunenburgh. This spring is situated near where the mica slate of the north unites with the talcose slate of the south part of the town, out really issues in the protogine formation of the river valley. It is within about ten rods of the Connecticut river, and on our warmest days the thermometer stands at 46½ F. in its water. It is strongly chalybeate, a gallon of water contains forty-six grains of mineral, a very large proportion of which is iron. It contains protoxide of iron, carbonate of potash, carbonate of soda and carbonate of lime, and a slight trace of magnesium and a residum of organic matter. Only a faint trace of sulphur compounds is found, and it evolves no gas. This water, doubtless, will be found very valuable as an alterative and tonic, as it is so strongly impregnated with iron as to impart to it a yellowish tinge. It is a large spring, and, like those in Brunswick, is not affected by drouth, and only slightly in temperature by the season. The extension of the White Mountain railroad passes on the opposite bank of the river, so this spring is easy of access. Following the Connecticut river down a few rods from the Lunenburgh chalybeate springs, we find some half dozen small springs issuing from the bank within the space of a dozen rods, all of which are more or less chalybeate. One of them, however, is sufficiently pure to be used for all household purposes by the family of James Phelps, Esq., on whose land they are situated. This spring contains about four and one half grains of mineral matter to the gallon, and from this the increase in different springs up to twenty grains per gallon. In all, the iron is the principal ingredients, and is held in solution by carbonic acid. The water is clear and pure when first drawn, but soon an ochreous sediment will be deposited on the bottom of the pail, or by boiling, which is hydrated peroxide of iron, liberated by the escape of the carbonic acid. About half a mile from West Concord, near the road leading to Concord Corner, is a sulphated chalybeate spring on the land now owned by Harvey Jeudevine, Esq. This spring has been dug out, but apparently not at its head, and now runs in an aqueduct to a dwelling where they make some use of it for household purposes, as there is no other water easily accessible. This spring issues from the talcose schist formation, and doubtless derives its sulphurous qualities from the oxidation of iron pyrites in the strata from which it issues. It is strongly impregnated with sulphuretted hydrogen, which makes the water seem more fully impregnated with mineral matter that the analysis shows. It contains twenty-three grains of mineral matter to the gallon; which consists of peroxide of iron, from protosulphate, sulphuric acid, silicic acid, carbonate of lime, carbonate of soda, a trace of sulphur, and organic matter. There is also in West Concord a mineral spring on the bank of Moose river a few rods above the bridge that crosses the river on the farm of William Gould, Esq., about midway between West Concord village and St. Johnsbury East village. This is a saline spring, differing materially from any other known in this section. It is situated near the junction of the talcose schist of Concord, and the mica schists of Waterford, really upon a connecting line, as near as can be determined, and probably issus from between the strata. It is not a strong mineral water, containing only nine and one-fourth grains of mineral matter to the gallon, and evolves no gas. It consists of corbonate of magnesia, carbonate of lime, chloride of sodium, silicon and organic matter. It seems to vary from time to time in its proportions, and it is consequently of apparently different strengths. Another mineral spring on the road from Bloomfield to Island Pond is found and doubtless others exist of which we have no knowledge. The larger part of this county is situated in the calciferous mica schist district, though there is argillaceous slate running through Waterford and Kirby, becoming quite narrow in Burke. Waterford, however is largely, especially all the east side of it, in the talcose formation, which is more extensive in Essex county, and belongs to the gold bearing formations. Some specimens of gold have been found in this town, and iron and copper pyrites in veins, as in Concord and other towns in Essex county; but no extensive openings have been made as in Concord. In Waterford there is an outcrop of slate that has been quarried for roofing slates with some success, as it is near St. Johnsbury, where there would be considerable demand for slate. It would doubtless be wrought at the present time with some profit. In Kirby, Kirby mountain, so called, is largely granite of very good quality. It is now quarried more or less. The granite producing part of Ryegate consists of an area of three hundred acres on the south and west sides of Blue mountain. Observation shows that the granite was undoubtedly thrown up by volcanic action, and lies in sheets varying in thickness from a few inches to ten or fifteen feet. Ever since the town was first settled, one hundred or more years ago, by the Scotch, this granite has been utilized to some extent. As many as seventy years ago, Joseph Carruth worked the stone from these quarries for door-steps, chimney jams, fire-places; etc. together with head-stones and rude monuments. Specimens of his work can be seen today in old buildings and grave-yards around Ryegate and Peacham. Later on a Mr. Sartwell, from an adjoining town, took up the business and carried on quite a local trade in the same line. Perhaps the most widely known monument of his time is the soldiers monument at Peacham, Vt: Next, Peter B. Laird and Joseph George commenced to work the stone at South Ryegate, and when the M. & W. R. R. R., was built through from Montpelier to Wells River, in 1874, Sumner Kimball, from Montpelier, bought all that part of the quarry land extending along the west side of the mountain, comprising about two hundred and twenty-five acres, and where the finest and best stock for monumental purposes is found. In 1875 R. F. Carter, from Baltimore, Md., came to Vermont, and purchased an interest in the business, and commenced the work in earnest, shipping stone both rough and in its manufactured state, to all parts of the country. Before this time the granite from the Ryegate quarries had been only known and used in a local way in our own state. In 1878 Mr. Carter bought from Sumner Kimball all his interest in the quarries, and moved to South Ryegate, where he built up the works known throughout the country as the Ryegate Granite Works. In every state, from Massachusetts to Colorado, and from. Dakota, to Mississippi, the stone from this, quarry, and the work from the Ryegate Granite Works, is known, and some of the largest public monuments in the country have been executed here. This quarry, undoubtedly, is the most extensive, and, all things considered, the best for monumental purposes in the United States. While the geological structure of the county in its rocks possesses no more than ordinary interest, the terrace in many sections are of great interest in connection with the drift that not only gave the northeastern part of the state its soil, but its surface stones and bowlders. The terrace system gives numerous beds of sand and clay suitable for bricks, which are extensively manufactured in the county. Hitchcock states that notwithstanding the size and number of terraces on the Passumpsic, we will not, at present, venture to specify more than two or three basins, so connected with one another are all the lateral terraces. The first of them extends from the mouth of the river in Barnet, to the northwest corner of the town of Waterford, near the Passumpsic station, on the Connecticut and Passumpsic Rivers railroad, and is about four miles in length. The river passes through a narrow valley in Barnet, a kind of gorge, with no terraces. Then there may be seen narrow terraces, which, at Passumpsic, expand and form a beautiful basin. The fourth terrace on the west side of the river passes into the next basin, which is embraced in the towns of St. Johnsbury and Lyndon. Upon this high terrace is the beautiful village of St. Johnsbury , designated as St. Johnsbury Plain. A. D. Hagar states that the base of the terraces at St. Johnsbury is composed of clay. The same terrace occurs on both sides of the valley beyond Lyndon, and the lower terraces may be seen at intervals. At the principal village in Lyndon a remarkably high terrace exists, which may have formerly extended across the valley to form the end of a basin. Its lower strata are clayey, and are remarkably folded and curved. West of this terrace the level is lower, and here is the course of an old bed of a tributary stream from the west. At the upper village of Lyndon the first terrace is about a mile wide, and the amount of terrace materials adjoining it is very great, and most of the materials are sand and fine gravel. Every tributary stream from either side has its large terraces to correspond with those of the Passumpsic; and it is a characteristic of these terraces, in distinction from those on the Connecticut and its other tributaries, that while they are very large, their number is small; in no case did the number exceed five, while on the latter streams the number often amounted to seven, eight and ten. The third basin, whose limits are not marked, comprises that part of the Passumpsic river (east branch), which flows through the territory of Burke. At the village of East Burke several terraces were observed, and near it there are four on the west side, and No.1 and No.4 on the east side. Above East Burke the valley rises so that its bottom appears like a terrace, with its steep slope crossing the valley at right angles; and there are indistinct terraces upon its sides. It seems to be too wide a valley to correspond with the size of the river, and may have been formed by some currents of water from foreign sources at an early date. There is no county in the state so well supplied with muck deposits as Caledonia. It has often been said, though it is not entirely true, that every farm has one or more convenient muck deposits. In fact, such deposits are so abundant that almost every farmer can avail himself of the advantages that muck offers as an absorbent in the stable, and many farms are rendered much more valuable by its use; and yet it should be much more used for that purpose than it is. It has little value when taken direct from the muck bed and placed upon the land; but nothing is more valuable than that for fertilizing purposes, after it has passed through the pig-pen or stable as an absorbent. It is a greater mine of wealth to the farmers of this county than all the gold mines of the state would be if the gold bearing rock was all condensed into the county. Let farmers take due notice and mine for their own advantage. Cenozoic - Modified drifts, including river terraces, glacial drifts, etc. Paleozoic - Calciferous mica schist. The granite rocks occupy a large V shaped area in the northern part of the county. Southward the apex of the V is in the town of Granby, south of the road from Guildhall to Victory. In this area, are several kinds of granite. It some places it is desirable building stone, and is quarried in Norton, Brunswick and Victory. In Ferdinand the granite is of an entirely dif-ferent character. That quarried at Brunswick is fine-grained, light-colored granite of good quality. With the granite rocks, especially southward, there are schists, and in the north corner of Granby, not far from Moose river, there is a granite that closely resembles the Concord granite of New Hampshire. But here there is the clearest evidence that it is eruptive. It not only penetrates the schist, but it contains many fragments of it. This probably extends into Victory, but the forest hinders positive knowledge. Near Brunswick Springs, but about three-fourths of a mile from the river, there is a beautiful porphyritic granite. The crystals of feldspar are about an inch in length. Syenitic granite.—In Lemington there is a granite rock unlike either of those we have mentioned, which probably forms the entire mass of Mount Monadnock, and extends into New Hampshire, where it has some marked peculiarities. Diabase and diorite.— These rocks generally occur in narrow dikes, and are of a dark green color, compact and tough. Every town contains more or less of the dikes, but a remarkable one crosses the Portland and Ogdensburg railroad near Miles pond, in Concord, containing twenty-two and one-half per cent iron. Stratified rocks-gneiss and feldspar, mica schists.— There are two well marked areas of these rocks. That on the east side of the county begins on the south (probably in Granby), extends northwest through Maidstone. Well marked outcrops can be seen near Maidstone lake, thence it continues through Brunswick. The Notch Mountains, south of the Nulhegan, are com- posed of this rock. The western band begins near Miles pond, embraces Miles Mountain, where the rock is largely gneiss and contains fibrolite. Extending northward it is interrupted by the graphic granite south of Island Pond in Brighton, to appear again in Bluff Mountain, which is its probable limit northward. Fibrolite schist.—In the west of Granby, there is quite an area of an argellitic mica schist that contains an abundance of fibrolite and and andalusite, and there is a repetition of this rock in Victory, extending into East Haven. It is also found in a limited amount on the east side of the. county, and with the feldspathic mica schist and gneiss. The Lyman group.— These rocks are so called from their great abundance in the town of Lyman, N. H., from whence they extend northward to the line of the Provinces. These rocks occupy a large area in the towns of Concord, Lunenburgh and Guildhall, extending also into Maidstone, where they cross the river into New Hampshire. They consist almost entirely of light gray agillites, and besides these are a few black slates. The Essex copper miner in Concord, is formed in this rock. The vein of copper is very irregular, and though much money has been spent but little return has been made, and it is now abandoned. Several other small veins in Concord and Lunenburgh have been partially examined, but none of them have proved valuable. Several fine specimens of gold have also been found in Lunenburgh. Most of them are on the land of H. A. Cutting, near the village, and on the farm of Cornelius A. Smith. Some fine gold has also been washed from the Connecticut river bottom against Maidstone. Calciferous mica schist.—This rock occupies a limited area in the county, and is confined to the western part of East Haven and Brighton. It consists of argillites, silicious limestones and friable sandstones, some of the richest soil of Vermont. Glacial drift.—Everywhere we find that the material which makes up the soil, and the bowlders that are found so abundant in some sections, have all been transferred from points northward of where they are now found; so that the soil is often composed of an entirely different material from the rock on which it rests. The bowlders in an open country can be traced to the ledges from which they were derived; but on account of the forests in this county, this in most places would require much time and labor; still in every neighborhood are many curious and wonderful things to be seen by anyone who will carefully observe the rocks. Modified drift.—On the Connecticut river, particularly in Lemington and Colebrook, are many interesting gravel ridges that are supposd to have been formed by glacial rivers, as the ice retreated up the valley. There is also a very peculiar ridge of coarse material in the vicinity of Island Pond. River terraces border the Connecticut from the Province lie to the southern border of this county. They consist of the present flood plane, ten or fifteen feet above the ordinary stage of water, and a terrace from forty to one hundred and twenty feet in height. They are from one-fourth to one-third of a mile in width. Doubtless a barrier formerly existed at the bend of the Fifteen miles fall on the Connecticut, and that the river valley was then the bed of a great lake, the outlet of which was through Whitefield, not far from the present line of the White Mountain R. R There are places beyond the height of land toward Littleton where the old river bed is so distinct as to leave no reasonable doubt of this theory being a fact. Minerals.—In addition to the copper in Concord, "Essex mine" and gold at Lunenburgh and in the Conneticut river above Bloomfield, there has been found copper at several places in Concord, as on the farm of William H. Darling, and on the land formerly owned by J. M. Darling, in "Texas," so called; also near West Concord, and combined with magnetic iron in a vein crossing the railroad at North Concord; also in Lunenburgh on land. owned by John Moneghan, and on land owned by George S. Balch. In Brunswick, on land owned by Dr. H. Coe, where fine specimens have been found. 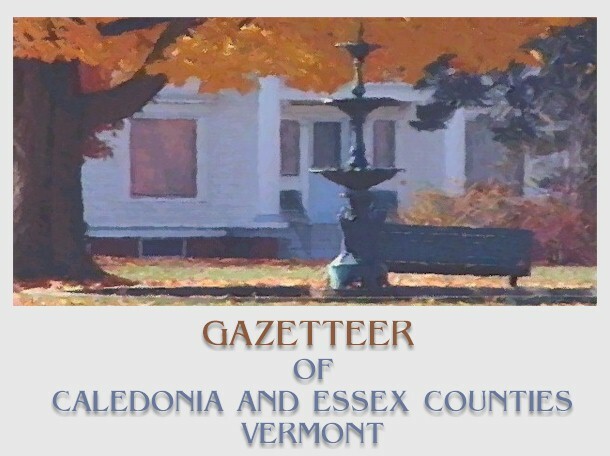 Galenite has also been found in Guildhall on a farm formerly owned by Mrs. Dr. Dewey, in the old meeting-house neighborhood. This vein seems to run northerly and crop out again on property now owned by Isaac Bowles on the hill. Here it is largely sulphurette of copper. It would seem quite probable that something of value might be developed by reasonable outlay in this section. Compiled and Published by Hamilton Child; May 1887, Pages 5-124.